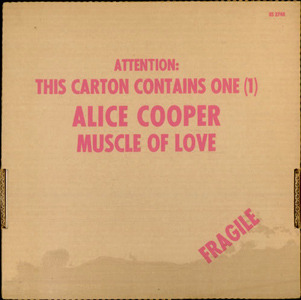 Muscle of Love is an album by Alice Cooper, released in 1973. It is the last studio album recorded by the original Alice Cooper band, and is a concept album about teenage angst, life on the streets of New York City, and implied male prostitution. In place of the usual jacket, the original LP was packaged in a shallow corrugated cardboard carton, with a "stain" intentionally printed along the bottom. The original release also included a paper "book-cover" with Teen-Age Lament '74 theme and an illustration of the band in pink and white. As per Alice Cooper (Billion Dollar Babies/Bob Greene, 1974), the track "Man with the Golden Gun" was intended to serve as the title song for James Bond film of the same name. The goal was for the song's popularity to force the producers of the film to use the song. However the ploy failed. "Teenage Lament '74" features Liza Minnelli on background vocals. The song "Muscle of Love" was covered by Fireball Ministry for their 2001 FMEP release.